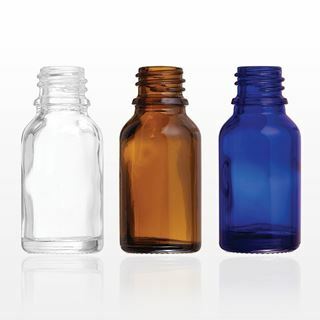 These 15 ml glass bottles are used for packaging small quantities of liquid formulations such as oils, aromatherapy products, personal care products or cannabis products. The blue and amber bottle colors are particularly beneficial for light sensitive formulas. Easily dispense these products using the corresponding caps, Part # 30016, 30017, 30018, 30019, 30020. 20,000 Pieces to Print a Logo. 1 Color Logo Printing Starting at Approximately $0.07 Per Piece. 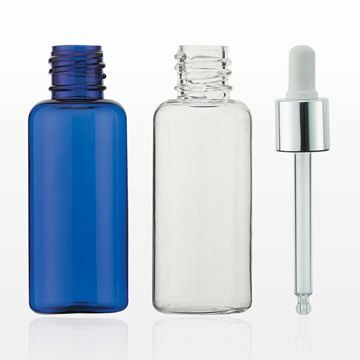 These glass dropper caps, in black or metallic silver and white, fit our 15 ml glass bottles (Part # 30021, 30022, 30023), which are ideal for packaging liquid formulations like oils, aromatherapy products, personal care products and cannabis products. This black screw cap fits our 15 ml glass bottles (Part # 30021, 30022, 30023), which are ideal for packaging liquid formulations like oils, aromatherapy products, personal care products and cannabis products. 20,000 Pieces to Change Color. This black fine mist sprayer cap fits our 15 ml glass bottles (Part # 30021, 30022, 30023), which are ideal for packaging liquid formulations like oils, aromatherapy products, personal care products and cannabis products. 10,000 Pieces to Change Color. This black lotion pump cap fits our 15 ml glass bottles (Part # 30021, 30022, 30023), which are ideal for packaging liquid formulations like oils, aromatherapy products, personal care products and cannabis products. This 30 ml PETG dropper bottles is used for easily dispensing small quantities of liquid formulations, like oils, aromatherapy products, personal care products, and cannabis products. Fits with corresponding glass dropper, Part # 29381. This 15 ml PETG dropper bottle is used for easily dispensing small quantities of liquid formulations, like oils, aromatherapy products, personal care products, and cannabis products. Fits with corresponding glass dropper, Part # 29374.